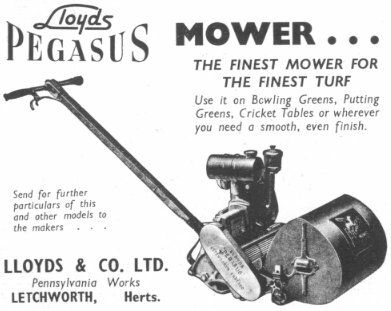 The Lloyds Pegasus was one of the first motorised mowers manufactured especially for fine turf surfaces such as golf and bowling greens. It was introduced in the 1930s and remained in production until the mid 1950s. Lloyds of Letchworth started to sell mowers 1878. Initially the company sold machines made in the USA but it eventually began to manufacture and then design its own mowers. The company developed a speciality in fine turf mowers for surfaces such as sports grounds. It has continued this tradition and remains one of the few independent manufacturers in the UK. The original Pegasus was powered by a small 75cc four stroke engine. Lloyds estimated that up to 90 per cent of the effort in using a hand mower was taken up by the cutting mechanism. By powering the cutting cylinder only, the designers removed much of the effort required but allowed operators to retain control over the mower on the delicate surfaces for which it was designed. Despite some early resistance by green keepers who believed that only a hand mower could do a proper job, the Pegasus soon became a great success. The quality of mowing is often measured in terms of the number of cuts a mower makes for each unit of forward movement, either in cuts per foot or metre. From this it follows that cuts per foot (or metre) will be related to the number of blades on the cylinder (or reel) and the number of times that the cylinder rotates for each foot that the mower moves forward. Many people believe that a high number of blades on a cylinder indicates that an older mower was designed for fine turf use. However this is not always the case. It should be evident that a cylinder with a lower number of blades but turning fast will produce the same number of cuts per foot as a slower cylinder with more blades. A high number of blades running slowly is better than a small number of blades running fast, for purely mechanical reasons, although the choice will always be a design decision affected by a number of factors. On many older machines, a high number of blades was often used partly to ensure a reasonable quality of cut because the mower ran slowly. On these machines the cutting cylinder was typically driven by chain or gears connected to the rear roller. The number of cuts per foot was closely linked to the forward speed of the machine. On modern mowers the cutting cylinder is often driven independently of the roller or wheels, as on the Pegasus. This means that the blades can operate across a range of speeds irrespective of the forward motion of the mower. This allows the mower to be controlled very easily while still giving a very high number of cuts per foot. 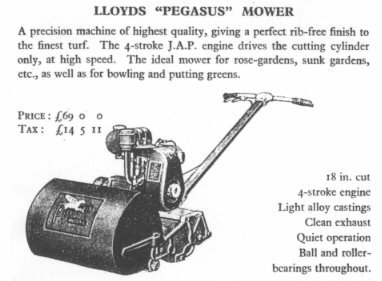 Like most mowers designed for specialist use, early examples of Lloyds Pegasus mowers are uncommon today. They are however popular among collectors when they are available.